Disclosure: I received a review copy from the publisher via the LibraryThing Early Reviewer program. The book opens with a disclaimer that while this book is “loosely inspired by the story of Amanda Knox,” it is entirely fiction. I decided to read the book not because I’m interested in Amanda Knox but because I really liked duBois’s first book, A Partial History of Lost Causes. All in all, I prefer her debut novel to Cartwheel, and what it comes down to is that the Cartwheel seems to have low stakes. Cartwheel focuses on the story of Lily Hayes, an American college student who moves to Buenos Aires to study. She finds her roommate Katy murdered about a month into their stay with a local family, and Lily is tried for her murder. She’s an idiosyncratic character who for some reason performs a cartwheel while being interviewed by the police or prosecutor, and duBois imagines that we’re invested in her story because of the surrounding media frenzy around her prosecution. We jump in time to cover Lily’s time in Argentina before and after the murder, and we see her story through her eyes as well as the eyes of her parents, her younger sister, her boyfriend, and her prosecutor. It’s a story about whether or not she could have murdered her roommate Katy. My feeling that the book has low stakes is that there doesn’t seem to be much of a focus on Katy, the murdered victim. A police procedural, at least, focuses on aspects of the crime and finding justice for the victim no matter how long it takes. Focusing on a woman accused of murder without paying much attention to the deceased seems like I’m gawking at the character of Lily. I’m ambivalent about this book, and I recommend duBois’s first book for more psychological insight and life and death issues: it’s about a young woman grappling with a Huntington’s diagnosis in her twenties after her father died of the disease. 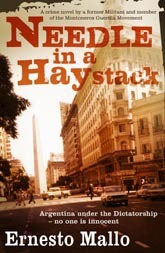 Needle in a Haystack takes place in Argentina in 1979, during the Dirty War where the military junta leading the country disappeared thousands of alleged subversives. The case at the center of this novel begins when Superintendent Lascano is called to investigate two dead bodies, but he finds three dead bodies instead: two were obviously executed by the military, but the third is a different sort of murder. The murder investigation does not take up the bulk of the novel. Instead we jump back in time to meet all the characters who are involved in the crime and the investigation. The set-up is interesting: how do you work as a homicide detective under a regime that cuts off investigations of murders it itself commits? How do you fulfill your mission then? The setting is absolutely nightmarish: military patrols, people yanked from their homes, and murders. Mallo details the corruption throughout the society, from the criminal justice system, the military, and the church. Besides the handicap of working for the police in a totally corrupt and violent regime, Lascano is also battling depression after the death of his wife less than a year before. He’s a damaged individual. He’s not the only character with a rough past: his friend Fuseli the pathologist is also a widower who also lost a child. It’s a book full of people with difficult pasts living under the military regime. Because it’s such a brief book (coming in under 200 pages), I don’t want to give away much more about the characters and the plot. Though it’s a short book, Mallo develops everyone’s backstory pretty thoroughly. Needle in a Haystack is my favorite book of the year by far, and I’m happy to know that there are two more books in the trilogy awaiting me: Sweet Money and Men Have Done You Wrong. Sweet Money has already been translated into English, and Men Have Done You Wrong (Los hombres te han hecho mal) was published in Spanish in 2012. Other reviews appear in Mrs. Peabody Investigates, Yet Another Crime Fiction Blog, and Petrona.